In 1717 Alphonse Costadau, an obscure Dominican friar, published the first installment of his Traité des signes. He set himself an ambitious task: "My plan has been nothing less than to assemble in a single corpus the principal signs that serve to express our thoughts and that have been instituted for each purpose, whether to form and entertain a perfect human society or to serve the pleasures and commodities of life, signs that, so far as I know, have only been discussed piecemeal." The Traité eventually filled twelve volumes and covered a formidable range of material. Costadau cataloged linguistic, gestural, sculptural, pictorial, religious, military, and sartorial signs; he even analyzed the signes diaboliques through which necromancers communed with demons. His first volume also featured a long chapter on musical signs from antiquity to the present. Costadau's project may surprise readers accustomed to thinking of semiotics as a twentieth-century discipline, founded by Charles Sanders Peirce and Ferdinand de Saussure. In fact, signs fascinated eighteenth-century writers, and they elaborated a sophisticated theory that embraced epistemology, language theory, psychology, economics, and aesthetics. The concern with signs stemmed largely from the new empiricist philosophy, codified by John Locke and ratified by Sir Isaac Newton's titanic achievements. If, as Locke claimed, all knowledge entered through the senses, then philosophy needed to study how the mind represented, ordered, and circulated sensory ideas. Aesthetic writers also gravitated to semiotics as they sought to define the precise nature of imitation; thus, Alexander Baumgarten, the founder of modern aesthetics, defined the poet's task as "heuristica, methodologia, semiotika." The famous treatises of the Abbé Du Bos, Charles Batteux, James Harris, Moses Mendelssohn, Gotthold Ephraim Lessing, Edmund Burke, and Johann Gottfried Herder all rely upon a careful analysis of signs and representation. Finally, the rampant speculation on language gave a mighty boost to the semiotic enterprise. Enlightenment sign theory has attracted much attention since the 1960s. The simultaneous publication in 1966 of Noam Chomsky's Cartesian Linguistics and Michel Foucault's Les mots et les choses exposed a wide audience to eighteenth-century linguistic and semiotic thought. The most thorough research has come from historians of linguistics like Hans Aarsleff, Lia Formigari, Ulrich Ricken, Marcelo Dascal, and Sylvain Auroux. When David Wellbery published his important study of Lessing's Laokoon in 1984, he planted Enlightenment sign theory firmly within Germanics, art history, rhetoric, and literary studies. Yet this research has made few inroads into music history or theory. While a handful of scholars have explored eighteenth-century sign theory, the subject still hovers on the interdisciplinary periphery. This seems a curious lacuna, considering how much of the best recent scholarship on Mozart, Haydn, and Beethoven concentrates upon rhetoric and semiotics. Inspired by Leonard Ratner's groundbreaking Classic Music (1980), Wye Jamison Allanbrook, Elaine Sisman, Mark Evan Bonds, James Webster, George Barth, Tom Beghin, Elisabeth Le Guin, Matthew Head, Danuta Mirka, and other musicologists and performers have explored the important role of rhetoric and topics in late eighteenth-century music. Meanwhile, Kofi Agawu, Raymond Monelle, Robert Hatten, David Lidov, and Michael Spitzer have offered distinguished semiotic studies of the Viennese masters. These scholars have revolutionized eighteenth-century studies, scotching forever the myth of a formalist "Classical style." Comparatively little attention has been paid, however, to how Mozart, Haydn, and their contemporaries understood language, rhetoric, or signs. The research into musical meaning awaits a fuller engagement with the general issues of Enlightenment representation. In a nutshell, we lack a "historically informed" semiotics of eighteenth-century music. Scholars can now hear Mozart's music played on period instruments, according to eighteenth-century precepts. They can analyze his scores with the benefit of contemporary theory treatises. They can even learn how audiences might have listened to his music. Semiotic research has yet to reconstruct a comparable "native" perspective. Such an enterprise begins with the recognition that musical signification, like performance and theory, differs between cultures and epochs and, therefore, demands different modes of interpretation. We listen for text-painting in Bach cantatas, but not in Frankish chant; we search for autobiographical expression in Mahler's symphonies, but not in Sammartini's. Such assumptions do not merely influence our interpretation. They also shape our research, determining the sources we consult and the directions we pursue. This book makes a start at reconstructing this context, exploring the ideas that informed the production and reception of meaning in Mozart's music. It offers analyses of selected works, illuminated by eighteenth-century writings on signs and language. The musical analyses range among Mozart's symphonies, concertos, operas, and church music; the written sources also cover a wide spectrum, representing French, British, German, and Italian traditions. Rather than sprinkle the text with isolated quotations, I have chosen to concentrate upon a small number of thinkers, presenting each author's semiotic writings within the context of his entire oeuvre. Admittedly, this approach runs the risk of reducing intellectual history to a portrait gallery of great thinkers. Yet it has the advantage of showing how sign theory fit within the fabric of eighteenth-century intellectual life. These authors appear as witnesses, let it be stressed, and not as influences. In the case of a musicien philosophe like Jean-Jacques Rousseau, we might well argue that ideas flowed directly from treatise to score. This book makes no such claim for Mozart. Of course, as Nicholas Till, Volkmar Braunbehrens, and Robert Gutman have documented, Mozart enjoyed wide intellectual contacts through Melchior Grimm's Parisian circle, the Countess Thun's Viennese salon, and the learned brethren of his Masonic lodge. His collaborations with erudite librettists and choreographers like Giuseppe Parini, Lorenzo Da Ponte, and Jean-Georges Noverre would have offered the composer further access to aesthetic and philosophical ideas. Indeed, the leading book dealer and publisher in Vienna, Johann Thomas von Trattner, rented rooms to Mozart and even stood godfather to both his sons. Nevertheless, this study does not argue for direct influence. It explores instead the common foundations of music and ideas, unearthing those basic assumptions about signs, language, and representation shared by composers, librettists, and philosophers. This is not to imply that Mozart or his fellow composers consciously realized the ideas of philosophers (although these figures people their operas). Leopold Mozart need not have read Locke to assert in his 1756 violin method that "all our perceptions originate in the external senses. There must therefore be certain signs which, through the eyesight, affect the will instantly, and cause the production of various tones either with the natural voice, or on different musical instruments, according to these various signs." Mozart's father was simply passing on received wisdom, echoing ideas that circulated among the educated classes during the eighteenth century. As Till put it, Leopold was "doing no more than reiterating the basic premise of John Locke's empiricism, the very foundation of bourgeois freedom to which he aspired." If this approach seems perilously abstract, let us consider the alternative. Suppose that we discovered a "smoking gun," that we could prove that Mozart read a particular treatise. In fact, such an example exists. In a letter of 4 April 1787, Mozart seems to have paraphrased a passage from Moses Mendelssohn's Phädon, a book he owned. If Mozart read the short dialogue in its entirety, as seems not unlikely, he came across this account of human cognition: "With every sensation a multitude of cognitions streams into [the individual], which are inexpressible to the human tongue; and if he juxtaposes the sensations to each other, if he compares, judges, decides, chooses, rejects-he multiplies this multitude into infinity. At the same time, an unceasing activeness unfolds the capabilities of the spirit innate in him." The passage faithfully expounds Christian Wolff's faculty psychology, rehearsing the Leibnizian theory of the mind as a "power of representing" (vis representativa). Based on this evidence, we might plausibly argue that Mozart was acquainted with a fundamental component of German rationalism. Yet we would still need to explain how the composer bridged the abyss between word and tone, philosophical argumentation and musical structure. As Bonds and Spitzer have emphasized, even the most "transparent" music-theoretical writing involves a metaphoric leap between verbal and musical domains. We must eventually appeal to some mediating construct, whether homology, episteme, systemic metaphor, or mentalité. Without such a deep structure, interdisciplinary connections remain a matter of random contiguity, like treetops blown together in the wind. Critics can either take refuge in a mystical zeitgeist or simply confine themselves to "the music itself." This study (to pursue the Herderian metaphor) reaches back through branch, bough, and trunk into that terroir from which the different arts and sciences spring. I shall argue that Mozart's musical expression reflects a core of assumptions that permeated late eighteenth-century thought. Specifically, his music reveals a new understanding of the relationship between the senses, signs, and human understanding. The question is not, did Mozart study Mendelssohn, or Rousseau, or Locke? But rather, what shared premises guided each man's work within his chosen métier? French thinkers figure prominently in this study, as befits France's leading role in European intellectual life, including the Austrian Enlightenment. Franz Szabo has documented reading habits within late eighteenth-century Vienna: "We get a clear picture of just how au courant Viennese high society was with an amazingly broad spectrum of Western (especially French) books. Voltaire and the Encyclopédie were apparently common currency with both men and women and passed from hand to hand and were avidly devoured by each in turn." The diary of Karl von Zinzendorf, a major source on Viennese musical life, provides a taste of this Francophilia. On 5 October 1762, Zinzendorf read Rousseau's Discours sur l'origine et les fondements de l'inégalité parmi les hommes, which includes the author's famous polemic with Étienne Bonnot de Condillac over the origins of language. The following day Zinzendorf completed François Veron de Forbonnais's Éléments du commerce, then went to hear Gaetano Guadagni sing arias from Gluck's newly premiered Orfeo ed Euridice. Mozart also enjoyed wide access to French ideas. While in Paris he came in close contact with Melchior Grimm, a family friend to whose Correspondance littéraire Leopold Mozart subscribed. Grimm belonged to the inner circle of Encyclopedists, which included Rousseau, Condillac, Denis Diderot, and Jean le Rond d'Alembert. Mozart also hobnobbed with the ballet reformer Jean-Georges Noverre ("with whom I can dine as often as I like"), author of the influential Lettres sur la danse (1760). Mozart, as Georg Knepler put it, "spent almost three solid months living in a bastion of the French Enlightenment." French ideas also permeated intellectual life in Milan during Mozart's operatic apprenticeship. Giuseppe Parini, librettist for Ascanio in Alba, was spearheading a literary reform based on il sensismo francese, drawing upon the theories of Condillac, Diderot, and Batteux. Even Mozart's childhood opera Bastien und Bastienne originated in a French source, an adaptation of Rousseau's Le devin du village. Of course, this study ranges beyond France, to encompass German, Italian, and British thinkers. This cosmopolitan approach matches the reality of intellectual life during the Enlightenment. Books circulated rapidly within the Republic of Letters in numerous translations, broadcasting ideas beyond national boundaries (Zinzendorf read Adam Smith's Wealth of Nations in 1778, only two years after its publication). The most gaping lacuna, as with most studies of Mozart and Haydn, is the Austrian tradition. Faced with the paucity of philosophical, literary, and music-theoretical texts, critics have understandably reached for intellectual contexts beyond Vienna-Sturm und Drang drama, the Lutheran musica poetica, Kant's theory of the sublime, Laurence Sterne's ironic narratives. The present study takes the same approach, although it perhaps casts a somewhat wider net. Methodologically, this book owes much to Wellbery's study of Lessing's Laokoon. Wellbery analyzed Enlightenment sign theory within a holistic context, synthesizing intellectual and sociological analysis. Likewise, I have aimed to situate Mozart's semiotic practice within a larger cultural web, exploring the ways in which his music participated in the intellectual and ideological life of the later eighteenth century. Unlike Wellbery's study, however, this book does not adhere to Foucault's theory of successive and discontinuous "discursive formations." I have inclined instead toward the dialogic critique of Mikhail Bakhtin and Julia Kristeva, which recognizes the multiplicity of genres, styles, dialects, and other social traces within the individual text. This "heteroglossia" traverses historical eras, as well as class and geographical boundaries, as Bakhtin explained: "A dialogue of languages is a dialogue of social forces perceived not only in their static co-existence, but also as a dialogue of different times, epochs and days, a dialogue that is forever dying, living, being born." 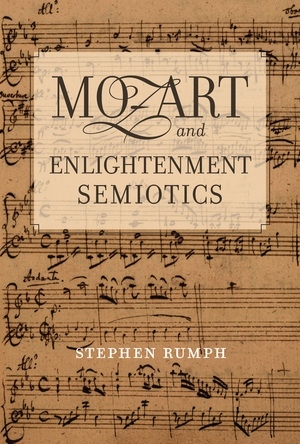 This book approaches musical meaning in Mozart as a dialogue of heterogeneous practices, each with its own intellectual and sociological entailments. Enlightenment sign theory itself discourages a more unified approach. For all their fascination with signs, eighteenth-century writers never produced a systematic semiotics. They discussed signs in multiple contexts-linguistics, epistemology, aesthetics, psychology, logic-but did not subsume these diverse studies within a single theory. The term semiotika itself appears sporadically, but without consistent meaning. For Locke, it meant the science of verbal communication; for Baumgarten, a general theory of representation. Meanwhile, the Encyclopédie article "Sémiotique" discusses the term exclusively in the ancient sense of medical symptomatology. As Sylvain Auroux explained: "The use of the concept 'sign' is not in itself governed by any direct definition. Its sense is purely operational." Accordingly, the six chapters of this book progress through linguistics, psychology, rhetoric, musical aesthetics, theology, and logic, unfolding the diverse functions of the sign within eighteenth-century thought. While this study approaches Enlightenment sign theory on its own terms, it also brings that historical theory into dialogue with modern semiotics. Some preliminary definitions will help prevent confusion. Following Peirce, I shall refer to that which represents as the sign and that which is represented as the object (terms which correspond to Saussure's signifier and signified). Sign and object belong, respectively, to what Louis Hjelmslev termed the expression and content planes. The relationship between the two planes determines the further opposition between syntax and semantics. Unless otherwise specified, syntax will refer to the structure of a single plane, semantics to the correlation between the two planes. For example, the hierarchy of musical meters (expression plane) and the hierarchy of social classes (content plane) each constitutes a syntactic structure; their correlation in dance topics forms a semantic relationship. The sign-object relation thus involves a mapping between structures, rather than a simple one-to-one correspondence. A major task of this book will be to define the intellectual, cultural, and social rationales that govern the correlation of signs and objects in Mozart's music. This brings us to the most original and elusive element of Peircian semiotics, the interpretant. According to Peirce, the sign-object relation is always mediated by a second sign, provoked by the first: "A sign, or representamen, is something which stands to somebody for something in some respect or capacity. It addresses somebody, that is, creates in the mind of that person an equivalent sign, or perhaps a more developed sign. That sign which it creates I call the interpretant of the first sign. The sign stands for something, its object." As Lidov put it, "the interpretant is the factor of the sign that instantiates, or realizes, the relationship of the representamen to the object." The interpretants of a musical sign might include a related work, a genre, a poetic text, a title, or the composer's biography. The interpretant can also be a structural concept, inherent in the syntax; hence, the idea of "hierarchy" allows us to correlate 6/8 gigues with the peasantry and 3/4 minuets with the nobility. The learned ideas of a culture, however diluted, also function as interpretants. Modern audiences steeped in Freud may find latent fantasies in an artwork, where an earlier age imbued with Romantic mythology would have heard traces of the artist's life. In the same way, I shall argue, a common stock of ideas concerning signs, language, and cognition informed the way Mozart and his contemporaries constructed musical meaning. This entire book amounts to a search for intellectual interpretants, those shared ideas that determined how Mozart's music signified. Die Augen Schwarz-richtig, schwarz. Die Lippen roth-richtig, roth. Blonde Haare-Blonde Haare. Alles trifft ein, bis auf Händ und Füße. Nach dem Gemählde zu schlüßen, sollst du weder Hände noch Füße haben; denn hier sind auch keine angezeigt. Alas, Papageno has not learned the conventions of portraiture, which allow a part to stand for the whole. In Enlightenment anthropology, mastery of signs went hand in hand with human progress, distinguishing civilized man from the primitive Naturmensch. The reader may perhaps be wondering, why is this book about Mozart? Why should a general study of Enlightenment semiotics focus on a single composer? To some extent, the answer comes down to personal preference. Yet I cannot escape the conviction that Mozart's music embodies the ideals of his age with unusual clarity. His theatrical bent, cosmopolitan upbringing, position within the emerging capitalist economy, and even his highly impressionable personality seem perfectly suited to the empirical, extroverted impulse of Enlightenment representation. Critics have hinted as much, as when Ratner claimed that Mozart was "the greatest master at mixing and coordinating topics, often in the shortest space and with startling contrast," or when Daniel Heartz concluded his magisterial Music in European Capitals (2003) with the suggestion that "the ultimate heir and greatest genius of the galant style, it could be argued, was Mozart." This book aspires, however, to being more than a study of Mozart. Hopefully, the ideas explored here can be extrapolated to Haydn, Boccherini, Salieri, Kraus, or any other composer of the age. Before getting on with the study, I feel compelled to enter a final caveat. In some quarters, intellectual history is still regarded as peripheral to musicological research, an indulgence readily sacrificed to Occam's razor. On this view, composers would seem to be swimming in a transparent sea through which ideas pass like bright tropical fish. I hold emphatically to the opposite belief: that a society's intellectual presuppositions shape every aspect of cultural life, including music, and that our understanding of intellectual history, far from being superfluous, informs all our interpretations of musical composition, theory, and reception. As I see it, composers are the little fish and ideas the sea through which they swim. The task of criticism is to describe those fascinating patterns of turbulence where talent beats against the currents of history. Stephen Rumph is Associate Professor of Music History at the University of Washington and the author of Beethoven after Napoleon: Political Romanticism in the Late Works (UC Press). 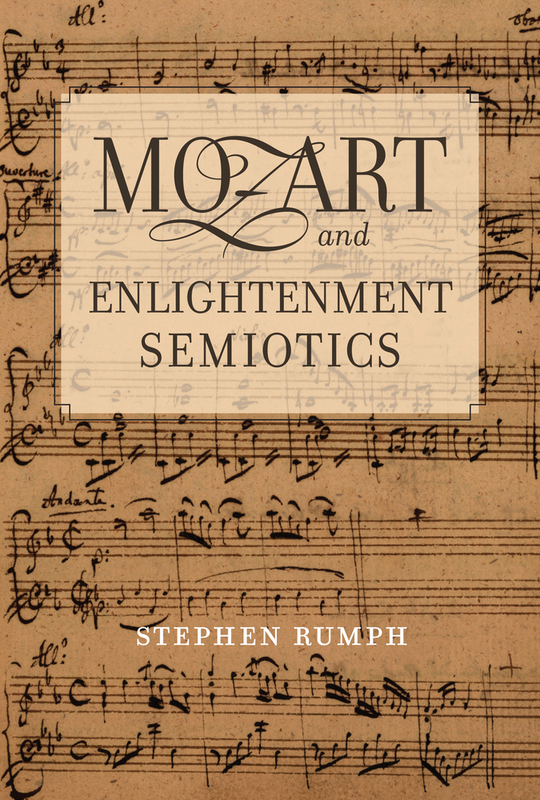 "In Mozart and Enlightenment Semiotics, Stephen Rumph shifts the ground of interpretation for late eighteenth century European music by reinstating the semiotics and language theory of the period. In so doing, Rumph challenges and reappraises current orthodoxies. These challenges are extremely valuable, bravely offered, and intuitively right as well as convincingly argued." "Stephen Rumph’s book is, to my knowledge, the first successful attempt to ground classical music in its contemporaneous intellectual context. In this respect, Rumph’s book is a great achievement. It is an imaginative tour-de-force bursting with dazzling insights, and with an apparently encyclopedic range of intellectual reference in several languages."